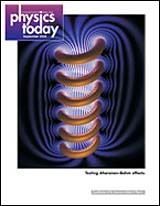 On the Cover: The notion, introduced 50 years ago, that electrons could be affected by electromagnetic potentials without coming in contact with actual force fields was received with a skepticism that has spawned a flourishing of experimental tests and expansions of the original idea. Herman Batelaan and Akira Tonomura. Sept 2009. The Aharonov–Bohm effects: Variations on a subtle theme. Physics Today 62(9). Herman Batelaan is professor of physics and astronomy.